WATCH: How adorable is Jennylyn Mercado with her fresh new haircut! Bangs are so in trend right now and Ultimate Star Jennylyn Mercado is totally giving us that Korean vibe with her new hairdo. Check out the Pinay Steffi rocking her new chic look as she spends some quality time with her son Jazz. In a recent interview, Kapuso actress Katrina Halili was asked who else among the GMA stars she'd like to play villain to and she answered "Jennylyn." 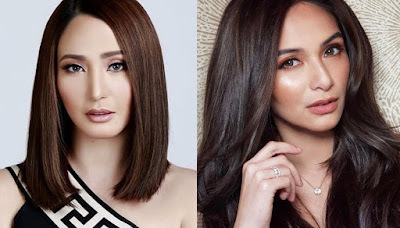 Katrina and Jennylyn are both graduates of the first season of the phenomenal reality-based artista search 'Starstruck' where Jennylyn emerged as the Ultimate Female Survivor and Katrina as one of the most successful avengers from their batch. Katrina has played villain to several leading ladies like Marian Rivera, Heart Evangelista, and even Angel Locsin but she has yet to work with the Ultimate Star. Jennylyn and Katrina's last TV project together was 'Forever In My Heart' which aired more than a decade ago. How exciting would a Jennylyn and Katrina rivalry would be? What do you think Kapuso? Jennylyn Mercado returns as a special guest on Sunday Pinasaya as Beauty Queen Pia.